It’s 2017 and the robots are here. But artificial intelligence (AI) is nothing to be feared. In fact, AI will help boost your sales, increase conversions, and ensure that your business thrives and stays relevant in an ever-changing world. If you have resisted AI up until now because it sounded too complex, read on. We’re going to explain how it can turbocharge your sales in plain, understandable English. We’ll be covering everything from chatbots and personal assistants to how AI can ramp up your email marketing efforts and tighten up your security. As a business owner, this could be the single most important article you read as you safeguard your company’s future because AI is already literally everywhere. Your rivals are already using it, and it’s the future of pretty much everything. No matter how good you are at marketing at the moment, AI is a game changer. Artificial Intelligence, Machine Learning, and Deep Learning … What’s the Difference? You may have already heard of each term. They’ve been making the rounds for a while now. But what does each one do? They’re all inter-related. Artificial Intelligence is like the father figure – it came first. It was followed by machine learning and then deep learning, which both assist AI in their own way. Each of the latter fit inside AI, with deep learning driving much of AI’s recent innovations. Of course, artificial intelligence has captured the public’s imagination for a long time now. Since the 1950’s when it was first introduced in computer science circles, it has simmered in people’s minds as something straight out of a sci-fi movie. Was AI going to birth robots? Would it take over the world? In fact, it’s only as recently as 2012 that artificial intelligence finally took off. Since then, it has been getting more and more advanced. These days, AI is the reason technologies can perform certain tasks, such as voice and face recognition on smartphones. Where retail is concerned, AI is able to identify patterns, analyze data sets, and create a much more personalized shopping experience in a way that you or I simply cannot. Machine learning, meanwhile, is a subset of AI. It uses algorithms to gather and learn data before making a prediction or a solid determination about something. It’s a lot different than hand-coding a set of instructions in order to complete a task. 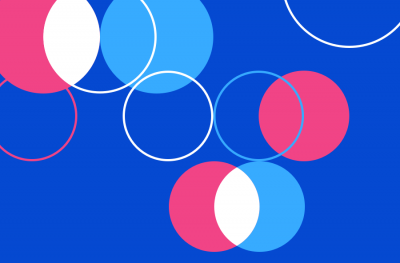 Instead, machine learning is trained to sift through huge swathes of algorithms and data before learning how to perform a task, such as how to chat with your customers and personalize content. Deep learning, conversely, is a technique that implements machine learning. It has allowed the various practical applications that machine learning can carry out, and is therefore essential to the future of AI. It reaches new levels of accuracy for many important problems. Deep learning helps to break down tasks so that numerous machine assists are even possible, such as driverless cars. So what can all of this do for your sales? Personalization of the sales cycle helps you learn more about your customers and what they want. And according to a survey of 206 organizations carried out by Evergage and Researchscape International, 96% of the 206 organizations surveyed believe that personalization helps to advance and strengthen customer relationships. It’s hard to know exactly what a customer wants unless you have certain information about them, such as their past buying habits. AI collates this kind of information so that it is able to offer each individual customer more of what they want and less of what they don’t want. From here, you can then develop personalized sales strategies that are based on accurate customer trends. If anything feels like AI, it’s Amazon’s Alexa, an individual’s very own personal assistant. 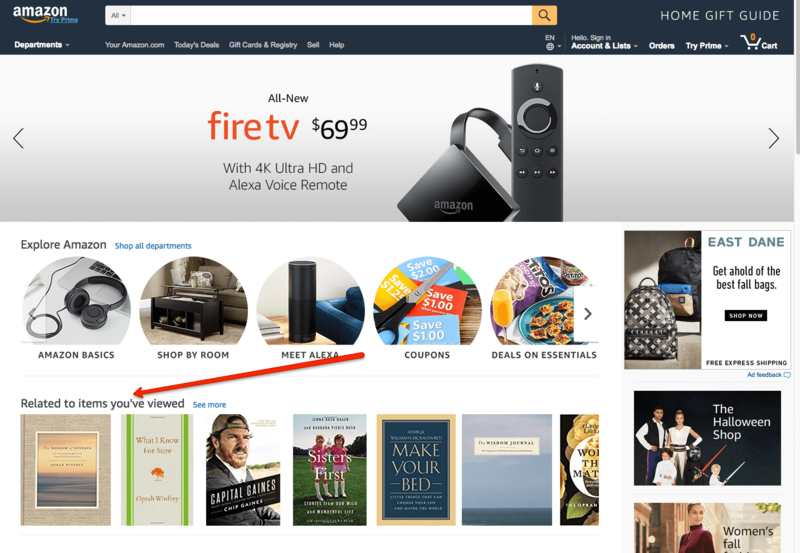 Alexa relies on various physical devices – from the Fire TV to the Amazon Tap – to use as her brain. And while she emerged in 2014 as a bit of a gimmick that people talked to in order to place an order, she is now a trailblazer when it comes to how AI can power businesses with personal assistants. An AI shopping personal assistant can communicate with your customers in different languages, as well as help to curate their preferences. A customer can ask an AI personal assistant a question and receive a quick, accurate answer. This means that, rather than click away from your store empty-handed, the customer can make the right purchase. Here you can see Stitch Fix offers a Personal Stylist, which is a different type of personal assistant powered by AI. It uses data analysis software and machine learning to match users with personalized clothing choices. One of the issues customers have when searching for something is that they’re not always sure what the name of a product is. As such, the results are not always entirely satisfactory or accurate. In the ecommerce industries where the products typically have a lot of detail, visual search can be incredibly useful for converting potential customers. A study by Slyce shows that 31% of its visual search queries were for home decor and 39% were for apparel. Visual search is a technology that often allows users to take a picture of an item on their phone and then filter it through recognition software. A direct link to the product will then be provided so the customer can make the purchase. Wayfair has launched a new visual search tool that is powered by machine learning AI. Users upload a photo of furniture they like, and the search will return related styles on Wayfair’s website. Google has also released Google Lens, which uses machine learning to do a real-time visual search using your phone’s camera lens. 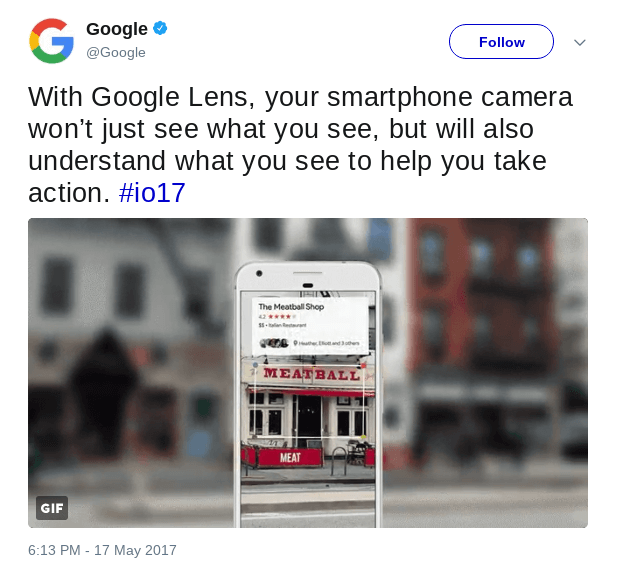 Below you can see an image of a search being made to find out more about a brick and mortar store using Google Lens. Do you feel as though there is too big of a gap between marketing and sales at your business? Maybe you feel as though your marketing side of things is awesome … but the sales just aren’t happening? AI can help. When you add artificial intelligence to your CRM, you get to focus on the right leads, as well as match up the right products to qualified buyers. Essentially, you’re pitching the right product to the right customer. AI lets you spend less time on the researching side of things and more time on selling. Gathering customer intelligence, qualifying the customer, and generating the lead in the first place can be taken care of with AI. Imagine if a customer who was almost certain they were going to buy from you suddenly left your store empty-handed? It could be for any number of reasons. But one of them could be that they just needed a bit more information and a bit more persuading. You can’t be on hand 24/7 to respond in real time to their queries, but chatbots can. Powered by artificial intelligence, the aim of these bots is to improve your sales, retention, and customer service. 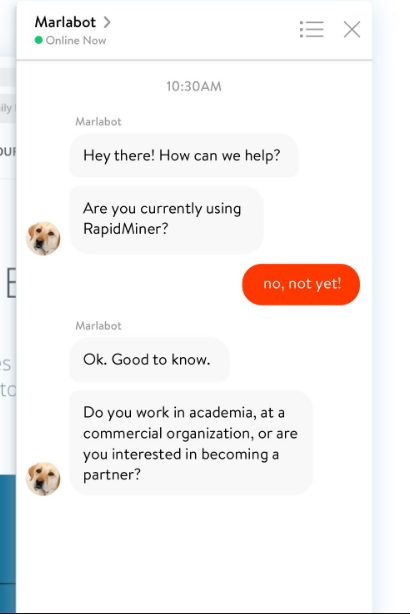 Chatbots help to build customer loyalty because they stay connected to your customers, answering their questions, focusing on their needs, and giving them more of what they want. They enhance the customer experience, ensuring the customer leaves with a positive impression of your business. 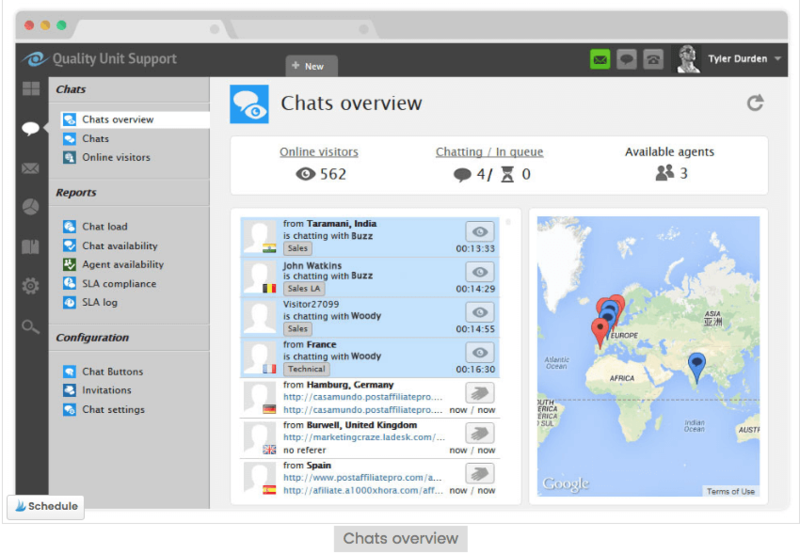 LiveAgent is a tool that provides the ability to have real-time communication with customers. This is what the tool looks like on the backend. Not too complicated at all! 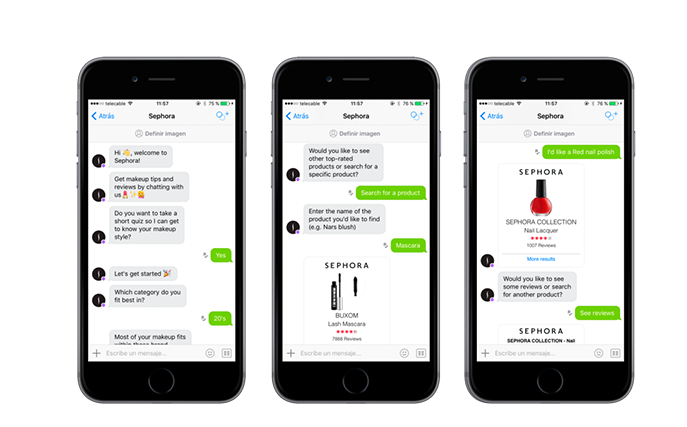 If forging a strong relationship with your customers is important to you, employing chatbots is a solid idea. Reviews are a form of social proof. If a customer needs a bit more persuading to buy a product, they can take a look at a few customer reviews. If the reviews are glowing in their praise for the product, the customer might be convinced enough to make the purchase. A problem faced by new online businesses is a lack of reviews. Without a few reviews, your product lacks social proof. On the flipside, too many reviews can exhaust the customer. So how do you get the perfect balance? As you guessed, AI can help. Shop.com is one site that has already adopted AI to collect and display reviews from across the Internet on its site. Thanks to natural language processing, AI is able to make sense of huge amounts of text so that customers get the general gist of the review and learn more about what others have to say about a particular product. When your online business really starts to take off, managing your inventory becomes essential. Imagine the jam you’d be in if you were running a deal on a particular product … only to later realize that it’s out of stock? A 2017 MHI industry report stated that “426 orders per second were generated from the website throughout the day” from just one e-tailer on Cyber Monday. Machine learning is the future of handling these situations effectively. AI has made inventory apps more efficient, ensuring you get actionable insights into your sales trends and inventory management. If a product is sold, your inventory updates automatically. 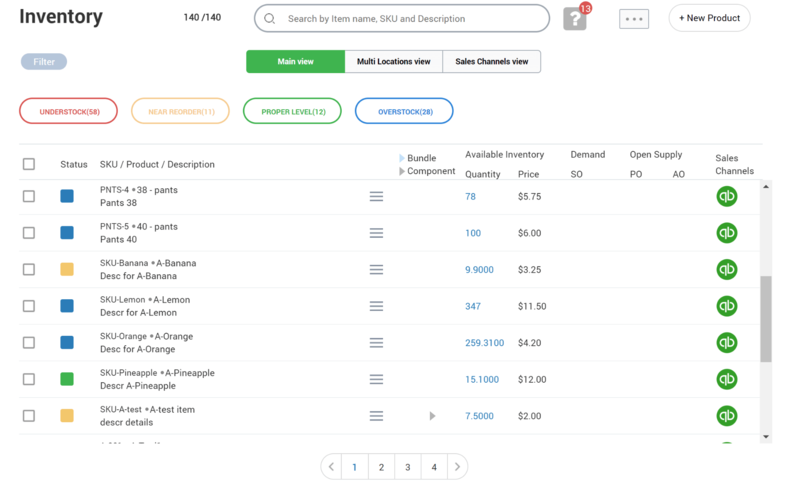 OpSignal, TradeGecko, and DataQlick Inventory Sync are some of the many Shopify inventory apps that use AI to measure large volumes of data, analyze them quickly, and generate actionable insight you can use. Some of them are even free. A data breach compromises your customers’ accounts, and it also damages your brand, eroding customer trust and confidence in your business. PayPal is just one online company that has already taken steps to implement AI in a bid to reduce the risk of data breaches and fraud. AI can spot suspicious activity and weed it out before it does serious damage, and it can also distinguish between a false alarm and the real deal. To protect your company, your customers, and your credentials, investing in AI is a sound idea. 77% of B2B content marketers use email marketing. But for a lot of businesses, email marketing is hard. We all want higher conversion rates, but unless we understand what our customers want to see from us in their inboxes, those rates won’t be rising any time soon. This is where machine learning comes in, which – you guessed it – knows more about your customers than you do. With over 205 billion emails sent every day, you have a lot of competition grabbing for your subscribers’ attention. You need a high open rate, and the key to this is the subject line. How much thought do you put into yours? A lot? Or is it an afterthought? AI uses machine learning to analyze your content, working out which lines and copy perform best for conversion rates. Have a look at this email I received from Cult Beauty. It’s the only email I’ve received in a while that mentioned my name, and did I click on it? You bet! It’s not just your subject line and copy that are key to how effective your email campaigns are. It’s everything, from your use of images to the times of day you send your emails. All of these elements are key to a higher conversion rate and a successful campaign. But unless you know this information, you’ll be forever experimenting manually. You can now use an email autoresponder to segment your list so that you send the right customers the right emails. For example, sending the exact same email to all your list sounds crazy when you think about it. Why would a customer who purchased a poster from you want to receive an email about something entirely different? It shows a lack of care on your part. AI allows you to segment your list so that you send curated, personalized content that’s targeted at specific individuals based on their past buying and browsing habits in your store. Therefore, your emails are always likely to hit the spot. 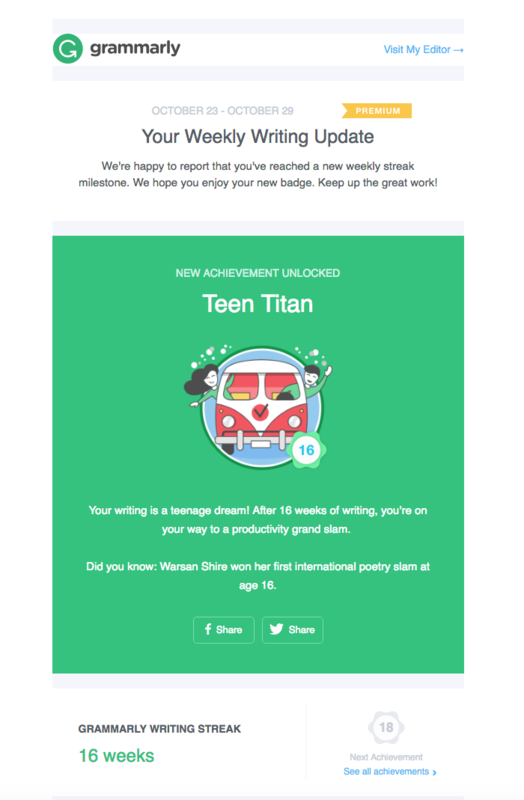 Below is an email sent to me by Grammarly providing me with my weekly writing update – letting me know I earned a new achievement. Strategies like this are fun and have subscribers looking forward to receiving your emails. Timing is everything when sending an email. The power of AI and machine learning can be harnessed to understand when subscribers are opening their emails. You can then create personalized send-times after analyzing data. 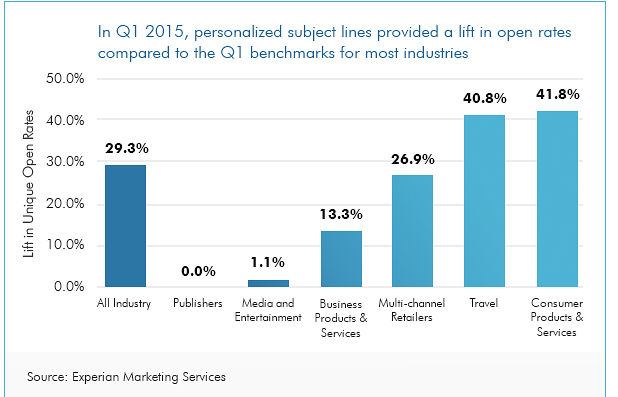 A study showed that 72% of respondents reported they are already using personalization for email. If you send emails out at the same time, a customer in one part of the world will receive it at 7:00 p.m., while a customer in another part of the world will receive it at 1:00 a.m.
AI puts a stop to this madness by understanding not just time zones but also when your customers are opening their emails. Everything has its limitations … but AI? There are limits in the sense that implementing AI can often take a lot of time and effort. Once it’s fully installed, of course, your life is a lot easier. Other challenges include understanding the systems, as well integrating AI with your other software and platforms. Moreover, using AI is not an excuse to get lazy. Your business must always be analyzing its results and progress. All of this can be overcome through time, patience, and a willingness to learn. We’re on the edge of an exciting frontier. Tantalizingly, this could be just the beginning. A report by Accenture found that adoption of AI across all industries could double economic growth rates by 2035. For online businesses, as AI gets smarter and finds more ways to enhance the way you market and sell, your business will become smarter, spotting trends with ease and identifying what else needs to be done to improve the customer experience. Once you get into it, AI is not that complex. It’s like anything we’ve had to learn, including the Internet and SEO. It’s just part and parcel of the evolution of tech, sales, marketing – and business. About the Author: Michelle Deery is a freelance writer for Heroic Search in Tulsa. She has a passion for producing valuable and engaging content and specializes in writing content for SaaS companies. Connect with her on Twitter @MichWriting.